David has the Big Fear. It doesn’t take a cabdriver too long to realize that once you leave the joy of shape-up and start uptown on Hudson Street, you’re fair game. You’re at the mercy of the Fear Variables, which are (not necessarily in order): the traffic, which will be in your way; the other cabdrivers, who want to take your business; the police, who want to give you tickets; the people in your cab, lunatics who will peck you with nudges and dent you with knives; and your car, which is capable of killing you at any time. Throw in your bosses and the back inspectors and you begin to realize that a good night is not when you make a living wage. That’s a great night. A good night is when you survive to tell your stories at tomorrow’s shape-up. But all the Fear Variables are garbage compared with the Big Fear. The Big Fear is that times will get so hard that you’ll have to drive five or six nights a week instead of three. The Big Fear is that your play, the one that’s only one draft away from a possible show-case will stay in your drawer. The Big Fear is thinking about all the poor stiff civil servants who have been sorting letters at the post office every since the last Depression and all the great plays they could have produced. The Big Fear is that, after twenty years of schooling, they’ll put you on the day shift. The Big Fear is you’re becoming a cabdriver. 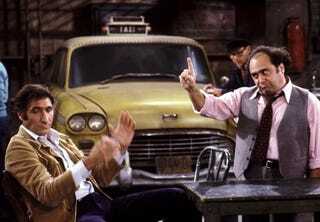 The typical Big Fear cabdriver is not to be confused with the archetypal Cabby. The Cabby is a genuine New York City romantic hero. He’s what every out-of-towner who’s never been to New York but has seen James Cagney movies thinks every Big Apple driver is like. A Cabby “owns his own,” which means the car he drives is his, not owned by some garage boss (58 per cent of New York’s 11,787 taxis are owned by “fleets” like Dover which employ the stiffs and the slobs of the industry; the rest are operated by “owner-drivers”). The Cabby hated Lind-say even before the snowfalls, has dreams about blowing up gypsy cabs, knows where all the hookers are (even in Brooklyn), slurps coffee and downs Danish at the Belmore Cafeteria, tells his life story to everyone who gets into the cab, and makes a ferocious amount of money. But mostly, he loves his work. There aren’t too many of them around anymore. The Dover driver just doesn’t fit the mold. He probably would have voted for Lindsay twice if he had had the chance. He doesn’t care about gypsies; if they want the Bronx, let them have it. He knows only about the hookers on Lexington Avenue. He has been to the Belmore maybe once and had a stomach ache the rest of the night. He speaks as little as possible, and barely makes enough to get by. He also hates his work.